This post contains affiliate links. Purchasing through them gives me a small commission but doesn’t cost you anything. Thanks for your support! When Tami starts posting her inspiration for her next patterns, I perk up! It’s usually something I’ve been seeing in stores or filling my Pinterest feed. The Lyric Peplum and Dress is no exception. The Lyric is a button-front woven dress pattern with all kinds of options. It features waist and bust darts and cup-size bodice pieces for a great fitting dress. You can do a simple flared or gathered skirt and there are five sleeve options as well. I did the flared skirt with elbow length bishop sleeves in a size 6 A-cup. I’m so in love with this dress! Love Notions patterns all come in a huge range of sizes. This one comes in sizes 0-24 with A, B, C, and D cup bodice pieces. They also have layers and no trim pages that make putting together the patterns a breeze. The tutorial is full of tips and alteration guides to get the best fit possible. When picking fabric, boy did I struggle. As a tester you walk this fine line between hopefully sewing up a garment that fits your body and your style and the possibility of it ending up in the donate pile almost immediately. I was hopeful for a garment I would love but also cautious as well. Dresses can be hard to fit and finding the right fabric would play a big part in that. I’ve had this gorgeous paisley print rayon in my stash for a couple of years. I picked it up in LA which means 1- it was cheap but 2- I couldn’t easily replace it. I had bought it thinking it’d be the perfect maxi dress or jumpsuit. I loved that it wasn’t a floral , lol, and that it has all my favorite colors in it; navy, blush, mint, and mustard. I knew it had the right flow for those bishop sleeves I can’t get enough of so I took a deep breath, said a prayer, and cut into it. Man, am I so happy I did! This pattern looks great in so many fabrics. I want a classic linen version next! Or chambray? Or stripes?! So many cute possibilities. Make sure you check out the listing for so many different versions and fantastic fabric choices. It’s one of those patterns that you can have multiple of in your closet and no one would ever know they’re all the same thing because with a simple change of fabric and sleeve options you’ve got a whole new look! You can grab your pattern here on sale through Thursday April 4th. Can’t wait to see all the Lyric’s filling my feed! Project Run and Play is an institution in the children’s sewing community. The talent that makes up the PRP alumni is staggering. When I heard that a group of past designers was putting together a capsule wardrobe collection, Project Farmer’s Market, I jumped at the chance to be a part of it! I was honored to be able to sew up a few pieces of the collection and to get together with a couple of past PRP contestants for an epic photo shoot was like a dream come true. For our shoot, I joined Lisa of Mabey She Made It and Sabra of Sew A Straight Line. My kids had met theirs at past photo shoots or park playdates and it was so fun to see them instantly get comfortable with each other. You could tell this wasn’t their first rodeo as they turned on the charm and smiles and nailed whatever us crazy moms told them to do. Totally blogger kids and such cuties! A HUGE shout out to Raspberry Creek Fabrics for sponsoring this photo shoot. All of my fabrics are from the shop. 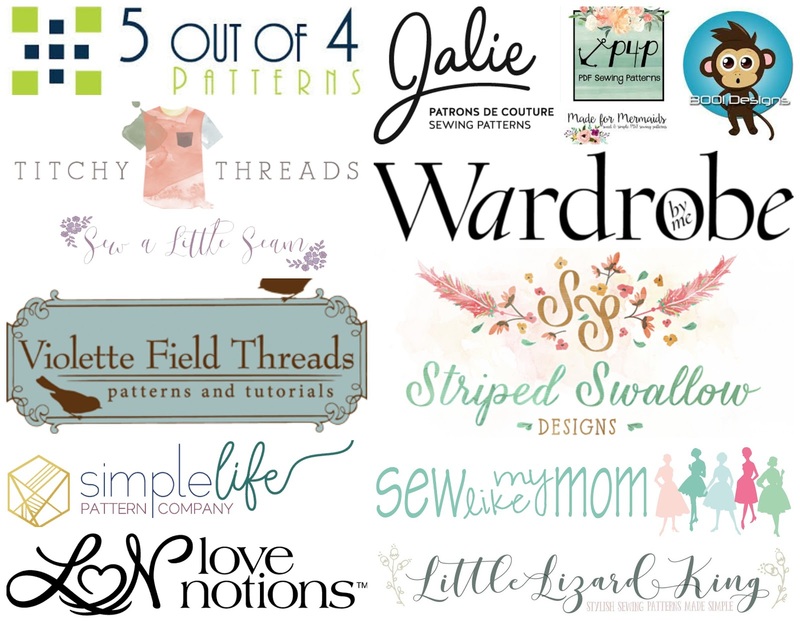 For my looks I sewed up 5 pieces from the collection (and one freebie!). I sewed the Banana Boat Tee, Soleil Skirt, Turnip Up Trousers, Up Beet Tee, and Jonagold Jumper. The collection is full of both girl and unisex patterns and a huge size range making them something you can use for years to come. I really love patterns that I can use for multiple views and more than one kid. These patterns checked all my boxes. Charlie got a pair of Turnip Up short and an Up Beet Tee from Celina of Petit a Petite. This is such a great summer outfit. The Up Beet Tee has such a unique construction. The sleeve piece extends to the back yoke for such a cool look. I love the stripe and solid pairing- it really highlights the shoulder detail. Of course I had to throw on a little vinyl. This little guy is looking so ‘fresh’ it was totally appropriate 😉 I used a font and image available in Cricut Design Space for a tee that was perfect for our produce themed shoot. The Turnip Up Trousers are so full of amazing details. I love the bound seams and he loves the knit waistband. With multiple pockets these are perfect for those little treasure hunters out there. I love this easy tee and shorts combo. It’s comfy but definetely not boring. With unconventional details these patterns are great additions to my pattern collection. My Sophie is at the top of most kids sizing and I was thrilled to see she could squeeze into this look by Jess from Lil Luxe Collection. The Banana Boat Tee and Soleil Skirt were just perfect for this fashion forward tween. The Banana Boat Tee is so darn cute! I want it in my size! Sleeve cuffs, button tabs, side drawstring rouching, and a wide boat neckline take this tee over the top. So many darling details! In a drapey rayon spandex, it pairs perfectly with the Soleil Skirt but also looks so cute with jeans. The Soleil Skirt has a faux front button placket, back elastic waist, pockets, three lengths and optional suspender straps. It’s one I can see turning to again and again. The Jonagold Jumper was the one I was most excited to sew up. My girls have been begging for overalls and it’s just so hard to get them that fit them both in the length and width. Shortalls can be soooo short on their long legs and long overalls tend to be capris 😉 This pattern is so full of options they can have a closetful now! I sewed up the squared bib, shorts version but there are also pant and skirt options. You can add patch pockets to the bib and front hips too. This simple chambray version will get worn to death this summer! I sewed up the free Seed headscarf and it adds the perfect touch to this outfit. I’m so thrilled to be able to share this amazing collection with you. What a pleasure it was to be back in PRP mode for this shoot! For some serious eye candy, sit back and relax with the brilliant Lookbook– so much goodness in one place. You can get the whole Project Farmer’s Market Collection here, the unisex mini collection here, and the girls mini collection here. All individual patterns are available in the PRP shop. Can you believe we made it to the last day of the Suit Up For Summer Blog Tour?! Not gonna lie, I’m going to sleep well tonight! I’ve so enjoyed sewing swimwear and the sensational seamstresses on the tour have continued to impress me day after day. My jaw hits the floor with each new suit I’ve seen. It’s been a week of incredible ingenuity and I’ve found so many prints and patterns to add to my sewing queue. Make sure you read to the end of the post to take advantage of the great discounts and to follow the links to all the other stops on the tour. Grab a cup of your favorite beverage and settle in for some awesome inspiration. Today I’m sharing a trio of suits and their matching cover-ups. This fabric combo right here has been taunting me in my dreams ever since I laid eyes on them. I saved them to sew up very last as my incentive to get everything else done! All that blush pink makes my heart burst! For the swimsuit I used the Blush Floral swim knit paired with Mauve Polka Dot Mesh. This fabric combo is so sweet and precious. I used the Lainey Swimsuit from Made for Mermaids. I knew I wanted a little ruffle for the mesh and the Lainey includes a ruffle option. I used the double ruffle hack on the M4M blog to really highlight that pretty mesh. I adore this pattern and I think she’s gotten one every year since it released. I think that’s a tradition I can get behind. I love the bum coverage and that one shoulder look is just so adorbs! If you are new to sewing swimsuits I highly recommend the Made for Mermaids patterns for great step by step instructions (Boo! Designs is another pattern company that is fantastic for swimwear beginners). The construction of the suits is pretty ingenious to give you hidden seams whether you do a full or partial lining. For this suit I fully lined the bottoms and just lined the front of the top. This fabric is surprisingly thick and opaque for having so much white background. In general, Raspberry Creek Fabrics base is a little thicker than what you might be used to and I never worry about it being sheer. I used another Made for Mermaids pattern to create this perfect cover-up. The Spencer Robe is a great unisex pattern that can be used for so many things. In this gorgeous french terry it makes the ideal thing to throw on before or after a swim. It’s not too thick but is still nice and cozy. Made for Mermaids is celebrating a huge milestone in their Facebook Group with a discount code through tonight March 15th at midnight CST. Now’s your chance to grab these patterns for a steal! This girl has been wanting a real one-piece swimsuit forever! I always have to gear up for lots of size blending and a couple of muslins to get something that will fit her lean long torso. 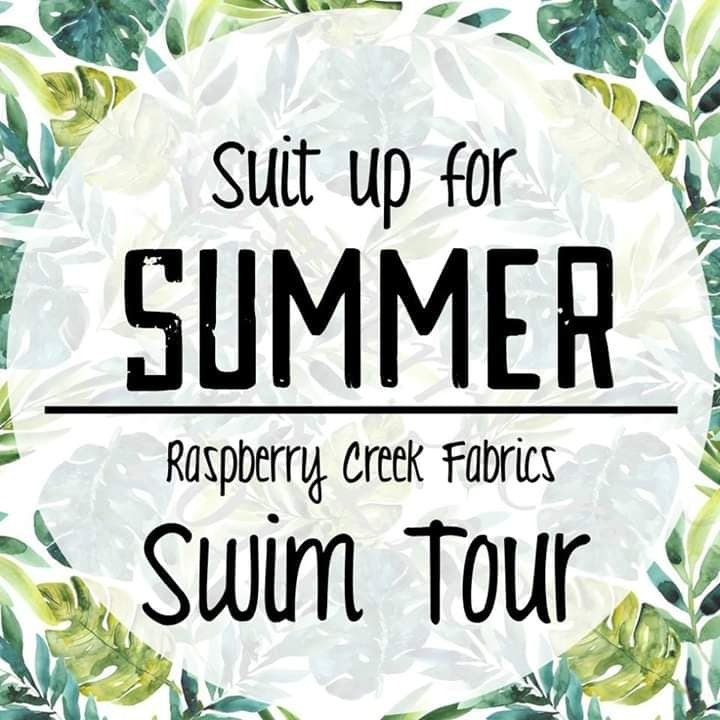 The Mairin Swimsuit from Sew A Little Seam was such a good pattern to work with and we’re loving this classic suit. Paired with some Swim and Surf Shorts from Gracious Threads it’s a look that we both are crazy about. I think you can never go wrong with gingham and I’m thrilled that Raspberry Creek is offering it in red this year. This navy floral board short fabric was one of our most loved prints this collection. Together they make the most adorable pairing! This little man got one more suit too! The Palm Euros from Sew Like My Mom are just about the cutest thing on little boys. I used this stripe for a preppy look that we both can get behind. I sized up one size for him to give him a bit more wiggle room. These are jammers length shortened a couple of inches. Lowland Kids released this cute Racerback Hoodie this week and I knew it’d be a great top to throw on with his suits. In a cozy heathered french terry, it will be just warm enough after swimming. You can also grab a code to get the hoodie for just $4 in the Lowland Kids Facebook Group that is good through midnight tonight as well. These suits were some of my favorites ever! I love the vibrant cute fabrics and I’m glad I turned to some tried and true patterns for them. As I was sewing swimwear all week I took a few notes on things I couldn’t live without. You can find my swim fabric tips here but these are all my favorite tools to have handy. When it comes to cutting slinky swim knit pattern weights, a rotary cutter, and a cutting mat are your best friends. When trying to keep your seams lined up, you can never have enough clips. Glue sticks are also super helpful for bindings, hems, or even stripe matching seams. I use sharp pins when attaching elastic though so that I can guarantee the elastic won’t pull the clips off. Swimwear elastic is key! Most patterns will call for it and the stretch and width of the elastic are all vital. When sewing on my regular machine, I like to use Eloflex stretch thread in my bobbin. It gives your seams a little more stretch and stability than a regular thread will. For hems, I swear by Heat n Bond Soft Stretch. It will hold your hem in place and makes it super easy to fold the slippery fabric up into place. When actually hemming a stretch twin needle has always worked well for me. I will use a zig zag stitch for elastic but love a good double stitch hem on a rashguard or tankini top. Phew! Did you make it to the end?! Thanks so much for joining us this week. It’s been a privilege to work with so many fantastic designers and so many creative and gifted bloggers.